The most budget-friendly garage door installation will still cost enough to drive you in search of different solutions. As long as the garage door is still serving you with safety, you don’t have a reason to replace it. And here’s where some makeover ideas come to save the situation. You can actually improve the looks of the door without spending much. But bear in mind that such renovations are not only meant to enhance the aesthetics but the condition of the garage door too. That’s what designers call form & function. The first step is to improve function. That’s the role garage door maintenance plays on a year-to-year basis. 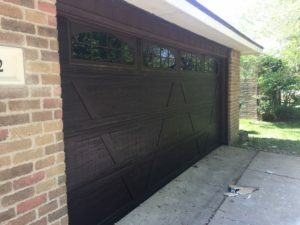 At this point, you need to see if some parts are really worn and need replacement or there are better options on the market currently that can offer better protection or facilitate the smooth movement of the garage door. Such examples would include stronger garage door tracks, nylon rollers, and tamper-resistant hinges. You won’t believe the difference a fresh coat of paint can do to your garage door’s appearance. Now, when it comes to such makeover tasks, you have several options. First of all, you can make the old steel garage doors look like wood with faux stains. Then, you can just refresh the door with a fresh coating and the question here is which color to choose. It depends on whether you like the garage door to stand out or blend in a mute way to the home’s exterior. You cannot really miss it due to its size but if you want a mute appearance, prefer the same color with the house’s exterior walls. If you prefer to make a bold statement, coordinate the garage door color tones with the home’s trims and doors. In order to have perfect results, you need to stick to the architectural style of your home – but not to the letter. The new garage door style must complement the existing home design but it would be best if it had that special something that would make it unique and interesting. For example, adding cross boards, nails, faux windows, strap hinges or other decorative elements to a flat overhead garage door can make it look like a carriage house door. But the door will look one-of-a-kind if it is weathered instead of having a solid color. And then, don’t forget that mouldings can come in all sorts of shapes and forms. No need to follow the same old classic of A, X, or V patterns when you can place trims in O, C or any other shape. Just remember that the size of the hardware and trims must align with the garage door size or they will not be pleasant to the eye. It’s all about scale and proportion. Remember one thing: whether you want the residential garage doors to stand out or not and whether you choose to simply paint them or add decorations too, the results of the makeover must be cohesive. In other words, your garage door must send out the message that it’s part of your home.